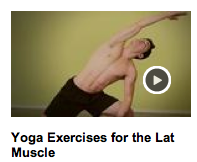 Click on the image here to watch my video for Livestrong.com on Yoga Exercises for the Lat Muscle with Juan Castano. I’m Kiki Flynn and this is yoga exercises for the lats. The lat muscles are the broadest part of our back and using the lats effectively gives great shape and tone, releases shoulder stress and actually increases our capacity to breathe and help us in every athletic endeavor. Through stretching and extension, we’re going to increase our ability to strengthen and contract. Inhale, raise your arms and turn the right foot, exhale, down. What we are looking for here is we want to have this full extension, the hip and leg are drawing this way from the waist up moving this direction, feeling this stretch right in here. With an inhalation, come up and firm wide arms, pivot the feet to the left. Let’s exhale down and again, we have this firm straight leg and extension all the way through here and we’re going to look for this stretch, lengthening, lengthening, lengthening, very good, inhale, up and let’s take our feet together.